Action launcher is celebrating its 5 years anniversary with a new update which is the Action Launcher v32. The newly released update comes with some new features, bug fixes and general improvements. 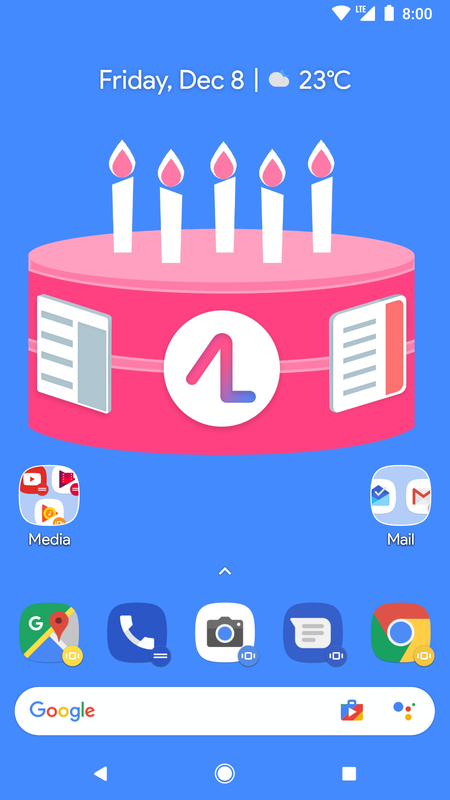 To celebrate the 5 years anniversary, action launcher is making some features like dock search box and Oreo style app shortcuts totally free, which means you no longer need the premium version of Action Launcher to access any of those features. Also, for starters, all new installs of the app will now default to a Pixel Launcher 2 style appearance. Those who own smartphones running on the latest Android 8.1 should know that an Oreo-style banner displays in the settings requesting the Storage permissions, this will allow Action Launcher to access the phone's wallpaper for its Quick theme feature. Aside the newly added features, the latest update has also been further optimized for better performance such as major bug fixes and also optimized boot time. The latest update is currently available for download on Google play store or you can just click on the link below.